First, there was the Mini Cooper. Then, came a four-seat convertible called, predictably, the Mini Cooper convertible. Next up was the Mini Clubman, whose major selling point was a rather dangerous three-inch vertical post directly in the center of its rear window. There’s also a Mini Coupe, and now a convertible version of that which is called the Mini Cooper Coupe Convertible. Or something. And apparently they will soon do yet another version called – I swear this is true – the Mini Rocketman. Yes, named for the Elton John song. But the latest New Car Review Without Actually Driving It examines the most ludicrous offshoot of a vehicle that was made popular by being incredibly small. Behold, the Mini Countryman, which Mini claims is a crossover SUV even though it’s only three inches taller than a Honda Accord. As an automotive expert, or at least a blogger with a spotty Internet connection, I feel compelled to review the Countryman even though I’ve never driven it. The Countryman is a reasonably good-looking car. Then again, it would’ve been hard to screw up – even for Mini’s parent company, BMW, maker of the 5 Series GT – since all they did was add two doors to a standard Mini and jack up the suspension. I like the cartoonish lights, I like the slab-sided doors, and I even like the big rear liftgate with the huge Mini logo on it. And somehow it manages to look even more whimsical than the regular Mini. 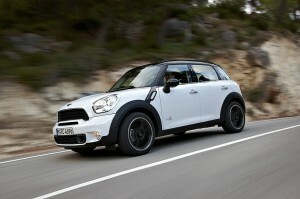 Maybe the only weak spot is that all the press pictures show the Countryman with black wheels. Why do you have black wheels, Mini Countryman? You’re not gangsta. You’re not even cool. You’re a crossover made by Mini. Leave the “murdered out” look to 19-year-olds with angel eyes on their E46 323i automatics, OK? The Mini Countryman’s interior is a lot like the regular Mini’s interior, which is to say that there are a lot of circles. No, really – Google it, like I did. The odometer and speedometer are circles – that’s normal. The air vents are circles – fine. But then it seems like they actively went and looked to make circles out of as many things as they could find, like the glovebox handle, the air conditioning display, and even the steering wheel controls, which look like the D-pad on a Super Nintendo controller. At least, they do on Google Images. I imagine they were about to make the seats into those giant, circular egg-shaped chairs before a German finally stepped in and put an end to the insanity. It is now, though, that I must point out the Countryman’s most egregious and laughable flaw. Instead of a rear bench seat and a traditional center console, the Countryman has two rear buckets and a movable center console which is on rails and slides between the front and back. If this strikes you as bizarre, it is. Not only do you lose the third rear seat, but you gain something that no human has ever wanted, asked for, or even conceptualized. 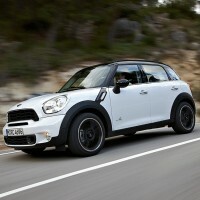 Needless to say, Mini is changing this, and the Countryman will soon have an optional rear bench. You know, for those people who would prefer hauling around an extra passenger to using an awkwardly-built center console that replaces the simple task of handing something to someone. Being a Mini, the Countryman probably drives pretty well. Not in its base trim level, of course, which uses a woefully slow (I would assume) 121-horsepower four-cylinder probably co-developed with Vespa to power their base-model scooters. No, I’m talking about the Countryman S, which produces 181 horsepower. Sure, it’s only 20 horses more than a Ford Focus, but who needs power when you’ve got black wheels? OK, fine, the Countryman won’t win any drag races. But its razor-sharp handling means it would fare a lot better than most SUV rivals on a racetrack. So if you’re ever driving a Countryman and another SUV driver makes fun of you, challenge them to an all-out ride through some twisties. If you can catch up. I’m not going to give you any real advice on the Countryman, since it’s a highly emotional purchase. Yes, there are better SUVs. The Ford Escape, Honda CR-V and Toyota RAV4 all offer far more space, more power, more equipment and similar gas mileage for the same money – which, by the way, is a not-cheap $30k or more for a reasonably equipped Countryman S. But none of them offer the Countryman’s cute styling, which is the main reason people buy the tiny little SUVlet. If you’re one of those people, I hope you like circles. Having had considerable seat time in one, I can confirm a couple of your theories; number one, you are correct insofar as they are exceedingly fun to drive. Not as much fun as a Cooper (a recent example of which I actually had the pleasure of owning for a few years, though only while it was under warranty ) but very definitely in the same close family. Kissing cousins as it were. The turbocharged S is the only countryman to consider. The naturally aspirated version is just slightly the wrong side of A Bit Wheezy, and if you’re spending that much damned money on a tragicomic subcompact fashion SUV-let it’d bloody better be able to get out of its own way. The S feels pleasantly though not conspicuously quick. It is surprisingly fuel inefficient, compared to it’s littler brethren, and it’s just as noisy and harsh at highway speeds as the mini MINI as well. Oh, and the circle theme extends far further than the photos you see on the internets; there are circles all over the seats, including a huge negative spherical section cap removed from the back of the front seats. They’re hilarious little things to sit in. Creaky as all getout on the move as well. And I have a horrible suspicion that Beloved is going to make me buy her another one before the year is out. I don’t know why these minis are called minis. The only “mini” was the original model, and the first one redone by BMW. the rest of the line up should be call “mediums” instead of “minis”. This new “mediums” are sad looking. They look like Elvis during his Vegas years; getting fatter and bloated by the minute.